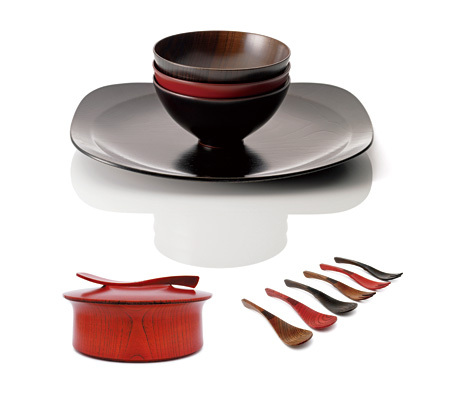 The "HASU"-series is a new Japanese-style tableware that is characterized by the principle of designing the plate and the bowl according to the same theme, which has never been done before. The plate and the bowl both have a circular shoulder line on the inside, which brings unity to the design and becomes an accent when the food is served in the dish. Storage-wise, the base of the bowl has been cleverly thought out so that it is stable, and there was also thought put into the design of the plate so that plates of the same size can be stacked easily. The cutlery series is also produced in an unprecedented method, which requires cutting the material that was turned on a potter's wheel. Successful in cutting costs, being an all-Japanese product and having a unique soft shape, the series thus realizes the ease of use and a pleasant taste. Both product lines are something that is not bound by conventions and they let one feel the possibilities of lacquer craft. This series proposes a new relationship between "the origin" and "the consumers", which is a proposition in the world of lacquer craft that tends to be bound by tradition from a sustainable point of view, and thus it is a good example of reflecting it with regard to the aspect of commercialization. The way of manufacturing by incorporating "the tradition of skills" into "present-day lives" is a clue to the future development of local industries all over the country, and the modesty and usability can lead to solving the problem of modern times where lacquerware is looked upon from a special perspective. The proposition and the spreading of using better products in everyday life might stand for the inheritance of a culture in a natural form.